How is movement of proteins and lipids between different domains of cell membrane prevented? 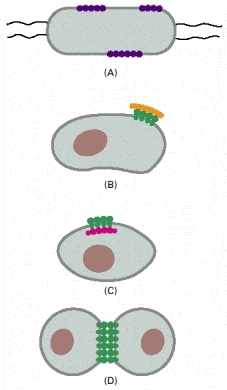 Why is the noncytosolic layer not able to do lateral movements between domains but cytosolic layer is able to do so? (A) They can aggregate together so that their relative positions are constant. (E) Not mentioned in the figure; mentioned in the comments. Lipid rafts are membrane regions which are composed of rigid lipids like cholesterol and sphingolipids. Lipid rafts are thicker than regular membrane and do not diffuse into the latter. Some proteins are specifically anchored to/incorporated into the lipid rafts (T-Cell receptor, IgE receptor) and their relative position with adjacent proteins (co-receptors) remains constant. Where did you read this. Both layers can do lateral movements; if proteins are specifically "anchored" to one side of the membrane then the concept of domain applies to that side only. Are intercellular junctions, synapses and light-capturing photosynthetic complexes mobile?